It is one of the largest car events in the city of Wichita and this year it will be even bigger and better. Automobilia’s 23rd Annual Moonlight Car Show Meet and Street Party is expected to welcome in more than 100,000 patrons and about 1,000 car entries, with a full day of fun and excitement from 6 p.m. to midnight on July 8 on First Street from Broadway to Old Town. Automobilia is a store in downtown Wichita that sells memorabilia and collectibles inspired by cars. Owners Gary and Lorita Carpenter started their local business back in 1981, and in 1995, a customer appreciation car show in front of their store started a long-standing Wichita tradition. 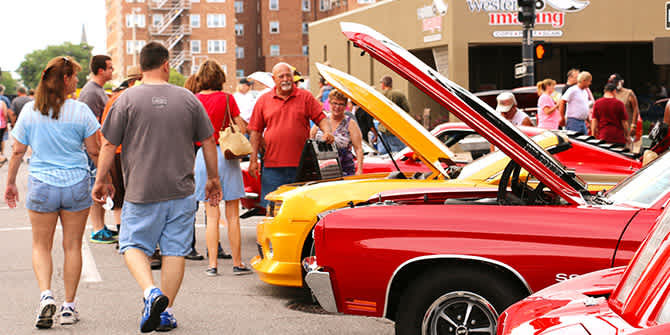 Today, 2 miles of downtown Wichita are now closed each year, as Automobilia’s Moonlight Car Show & Street Party has become the largest Air Capital car show occurring each summer. Patrons can enjoy countless classic and modified vehicles, live music and entertainment, a swap meet, model car contest, food and vendors and a special midnight cruise around Wichita. The free event allows the public an up-close-and-personal look under the hood of hundreds of classic cars, mods, motorcycles and other vehicles. Registration is open up to the day of the event. For $25, those wanting to enter a vehicle can do so until June 30. After the deadline, registration fees are $30 an entry. For more details on this or other car show events in Wichita, click here.